The koala (Phascolarctos cinereus) is unique for Australia and has its habitat in the forested areas of the South and East of the continent. It looks like a small bear but is a marsupial, like the kangaroo. 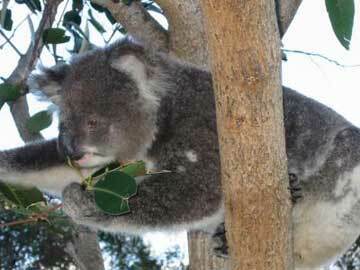 Koalas live in and eat the leaf of the various types of Eucalyptus trees. The eucalyptus leaves are not very nourishing, so in spite of the huge quantities they consume - the koala is a rather slow and helpless animal. He can not endure much stress (like fleeing imminent danger). Because the natural habitat of the koala is also the most attractive part of Australia for people to live in, the koala is endangered with extinction. Koalas can not cross roads quickly and are therefore frequently killed or injured in traffic. They cannot run away fast enough and so are - in built up areas - frequently bitten by stray dogs. The koala is an endangered species and many local councils have introduced a "Koala Management Plan" for the increased protection of the remaining animals. As a result of this the number of koalas in the area we live in (Port Stephens)is on the rise again, in spite of the high growth rate of the human population in the area. A koala needs about 1 to 1.5 hectare (2 - 3 acres) to feed on. He often does the same "circuit" that takes two to three weeks to complete and then visits the same trees again that got new shoots in the meantime. Our garden is part of such a circuit and as a result we usually see one or more koalas in the trees around our house every fortnight. When all goes well a male and a female animal live in a slightly overlapping area. In springtime one can hear them calling each other. That sounds like someone heavily burping after drinking a pint of coke..... Pregnancy only lasts about six weeks after which a bean sized little one is born. On its own this little one has to find its way from the birth channel to the pouch - which unlike kangaroos opens downwards. Once in the pouch it attaches to a teat and stays in the pouch for six months to get bigger.. As soon as it ventures out of the pouch it clings to the mother and should grow for at least another nine to twelve months before it can enter the big world. Because so many things can go wrong there are a number of organisations that are concerned with the care of injured or abandoned koalas. 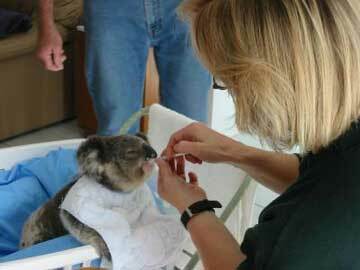 Our neighbors are qualified koala carers and have on a more or less continuous basis one or more injured or abandoned koalas in care. The animals are also fitted with a micro chip so later on the can be recognised more easily. A short while ago Betty and Geoff (our neighbors) got a little baby of about ten months old in their care: Robby. He is already twice as heavy as when he arrived and should go back to the wild to look after himself in about three to six months time. The little one was abandoned by its mother probably because it was bitten by a dog and could no longer hang on to its mother with an injured paw. The most serious cases - and the baby - can stay in the house in a converted child cot. The baby needs - apart from a large quantity of fresh leaves - also additional milk feeds. 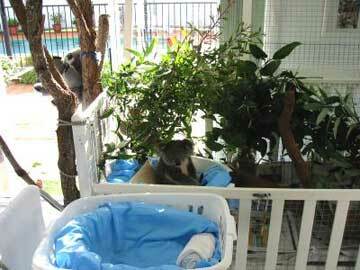 The bigger animals stay outdoors in two available cages and, in the last stage of their rehabilitation they can enjoy the "rehab" area: two trees with a cover and a smooth colorbond (sheet metal) fence so they cannot get away. Robby still has to learn everything, so under supervision he is trained regularly in climbing trees. In the meantime he clings to its carer like its mummy ... so the carer needs a fairly thick foam rubber buffer not to get hurt from the razor sharp claws. Do not underestimate the enormous amount of work and dedication necessary to take care of the dependent animals. Every day the cages have to be cleaned and twice a day fresh eucalyptus leaves have to be harvested of which a large quantity is thrown away uneaten. For, koalas are very particular of what they eat: some juicy looking trees - for reasons we can not understand - are ignored and other trees are almost bared. It is a good thing that the eucalyptus tree is such a strong species that can withstand lots of punishment. For example after forest fires fires the trees looks completely dead but shows green shoots after only a couple of months. To have enough leaves on the long term, we (my neighbor and me) have planted about 300 - 400 trees last year in the neglected area of forest behind our homes (national park)with financial support and consent of the council and the National Parks and Wildlife. First we had pathways slashed in the bush and then planted a mixture of swamp mahogany and melaleuca. The trees are doing well and will support the supply of koala food within three to five years. Apart from Robby we also have Maccarina in our garden regularly and Mad Max stops by once in a while. It is a pity that the territory in our area has been allocated already (10 - 15 koalas live there) so Robby shall have to be put back into the wild elsewhere. We'll miss the little bugger! Henk Tobbe - 9 June 2002. And since then more and other koala's have passed through our garden. At the moment we have a couple in love and a mother and baby. 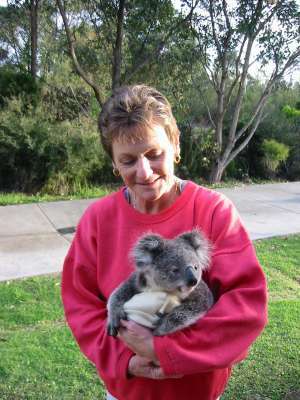 Have a look on our koala photo page.